Playing with cats provides a number of significant psychological and physical health benefits, and can even be used to stop undesirable behaviours, but only if it’s done right. Following these dos and don’ts will increase the likelihood of having a positive play session. Move the toy in the way that prey would move. For example, have a feathered toy on a fishing rod fly and then land and wiggle around, and move a ribbon or string in a slithering motion like a snake or make it twitch like a rodent’s tail. Alternate between smooth and wriggling movements and have the prey hide and then emerge like a small animal. Play in areas where the cat can seek cover (i.e., under a chair) and emerge to pounce as he would when hunting. When he captures the prey, let the cat play with it until he loosens his grip or drops it from his mouth before resuming movement. Use a toy for each cat when playing with more than one cat simultaneously. Ease out of the session by having the prey move increasingly slowly, as if it has grown tired, and letting the cat have one final capture so that he finishes with a sense of accomplishment. Make the game too difficult – let the cat capture the prey many times throughout the session. 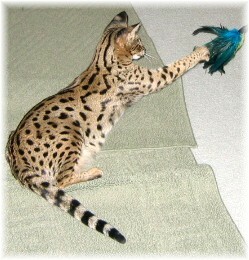 Dangle the toy in the cat’s face or bonk him in the head with it, forcing him to respond defensively by swatting at it. Cats usually find this stressful, and real prey would not behave like this. Move the toy around so wildly that the cat never has the opportunity to catch it, as this is frustrating and annoying for the cat. Keep bird simulation toys in the air all the time – let the “bird” land so that the cat has the opportunity to hunt it in the way he likely would outdoors – when the bird lands to eat. Yank the toy when the cat has it in his mouth or claws, as this can cause injury to the cat or break the toy. Encourage a cat to tackle your hands or feet during a play session – this may be cute when a kitten does it, but that kitten will grow up believing that this is appropriate behaviour, and as a full-grown cat, he will be capable of doing significant damage. Conduct play sessions regularly (ideally, anywhere from 5-30 minutes twice a day) and put interactive toys away when play sessions end so that they will be associated with special time that owners and cats spend together. Have a stash of toys and rotate them regularly to keep them fresh and interesting. If the cat still has energy to burn after interactive play sessions, provide solo toys such as mylar balls or cloth mice for him to play with on his own. If the cat doesn’t respond to the toys provided, try other toys or add a little catnip to the game, either by purchasing toys stuffed with catnip or sprinkling catnip on existing toys. Not all cats respond to catnip, but for those that do, it can really enhance a play session. Catnip is perfectly safe to use regularly.